Very similar to the C89MAB, this is a lovely looking cylinder vacuum with all the features you can expect from Vax. The large 2 litre dust bin container is more than enough room for servicing your homes twice over and emptying it just requires one button, making it really easy to use. Of course with it being multi-cyclonic, you won’t have to worry about diminishing suction as the filters won’t be so clogged with the dust particles atypical of older vacuum cleaners. The usual accessories are included, such as crevice and upholstery tools. The floor head enables the user to easily switch between carpet and hard floor cleaning. The 6 year guarantee is ideal for those who are looking for a machine that won’t fall apart in the next few years, like come cheaper cleaners. The 280AW suction power is remarkably powerful. Pet owners don’t forget that the H12 HEPA filter will help with those fine allergens. 280AW (air watts) suction power. Can use multiple times without having to worry about emptying the dust container. 6 year guarantee means less worry if something goes wrong. Small enough to store away, especially for smaller homes. Light enough to carry around. Easy to wind up power cord and turn the machine on/off. – Fairly pricey compared to other cleaners. 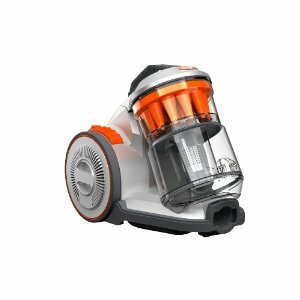 ← Better way to store accessories on a vacuum cleaner?